Your choice of anchor depends on the type of work being done and the amount of mobility needed as well as the connecting subsystem attached (e.g. 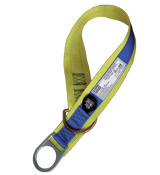 lanyard or self retracting lifeline). Fixed anchor points are typically the easiest to use, however they do limit your work space. Mobile anchors move with you, expanding your work area for maximum freedom of movement. All components must be made from quality materials strong enough to endure rough handling and exposure to the elements. Your anchor and connecting components must be rated for your application such as fall arrest, rescue, work positioning or material handling. Chose one that maximises strength and minimises weight. 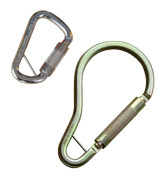 Extremely versatile anchors that are simply choked-off to the anchorage structure, to provide a fast and safe tie-off point for your personal fall protection system.​ Various materials including polyester webbing and cable, and numerous length options are available to suit any jobsite requirements. Our Saflok™ mining anchors were designed to be used with friction rock bolts in a variety of different mining applications. The Hybrid Mining Swivel Anchor is intended to stay in one spot, however it can be removed and reused if necessary. It is durable, lightweight and easy to install and remove and can be used with 47mm friction rock bolts. Our Saflok™ mining anchors were designed to be used with friction rock bolts in a variety of different mining applications. The Mining Bolt Anchor with Swivelling O-Ring offers the flexibility to move from location to location within the mine. It is durable, lightweight and easy to install and remove and can be used with existing 47mm friction rock bolts.